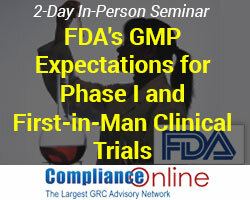 PALO ALTO, CALIFORNIA, UNITED STATES, April 1, 2019 /EINPresswire.com/ -- Led by ex-FDA official Peggy Berry, ComplianceOnline’s popular seminar on FDA’s GMP expectations for phase I clinical trials comes to Tampa in 2019. The 2018 sold-out event was attended by various biotechnology and pharma professionals representing FDA regulated organizations such as Pfizer Inc., Teva Pharmaceuticals, Advaxis, Inc., Ocular Therapeutix Inc., Cell Culture Company, Regeneron Pharmaceuticals Inc., Lifecore Biomedical LLC and others. Given the constant updates in the industry, each session in the seminar will cover these industry updates and focus on best practices on how to comply with the FDA requirements for the phase I clinical trials. The training will focus on the topics such as GMP requirements for personnel; QC function; facility and equipment; control of components, containers and closures; vendor selection and management; process validation and others. Speaker Peggy J. Berry is the President& CEO at Synergy Consulting where she provides consulting services to companies in all aspects of drug development. She also provides group and one-on-one training in drug development, regulatory affairs and project management topics. This in-person training will assist regulatory affairs personnel, managers, QA/ QC teams, documentation and others within an organization.